You may think you know your neighbourhood FairPrice like the back of your hand, maybe even memorised where each aisle holds which of your favourite snacks. 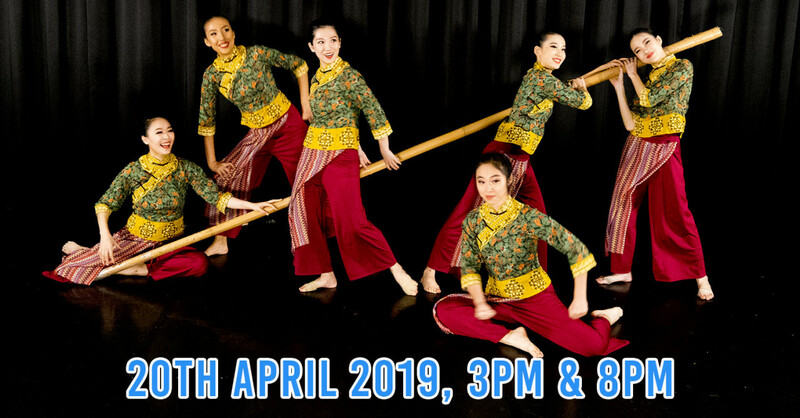 But the truth is that unless you've ever had to hunt high and low for that one elusive snack your mum insists FairPrice sells, you won't have seen the extent of FairPrice's inventory. Here's a list of 10 interesting food products that 90% of casual shoppers won't even know exist. 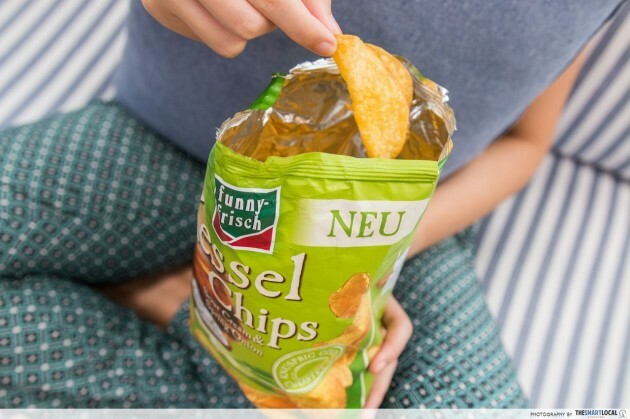 Attention chip connoisseurs: the #1 potato chip in Germany - Funny Frisch Kessel Chips - Sour Cream & Spring Onion has arrived on our shores. 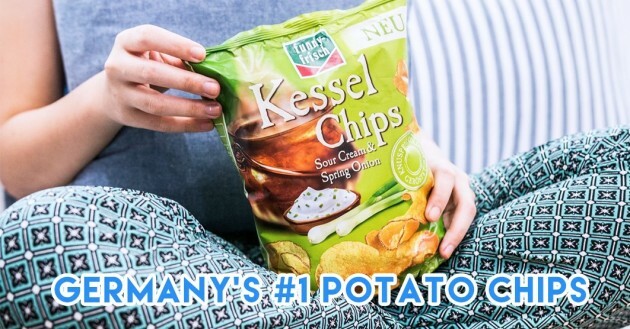 Kessel chips are tougher than your regular chip, but are also exceptionally crispy. Most sour cream chips only taste savoury, lacking the sour taste of sour cream, but the Kessel chips deliver in that regard. The sour cream and spring onion flavours aren't too overpowering, and you can still taste the nutty flavour of the potato. Don’t be fooled by its pricing - at $1.80 for 3 packs, it's as good as if not even better than atas brands. 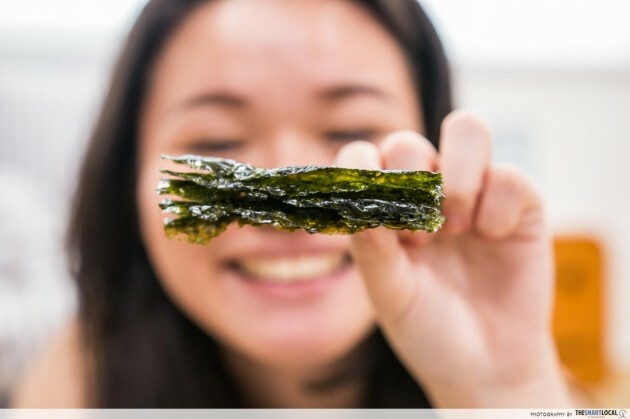 Made in the land of kimchi, you can have the waistline-friendly Hanmirae Teriyaki Seaweed Snack in one of 2 ways: straight out of the packet as a light snack, or scrunch it up and add it into your rice or soup to add an umami flavour. 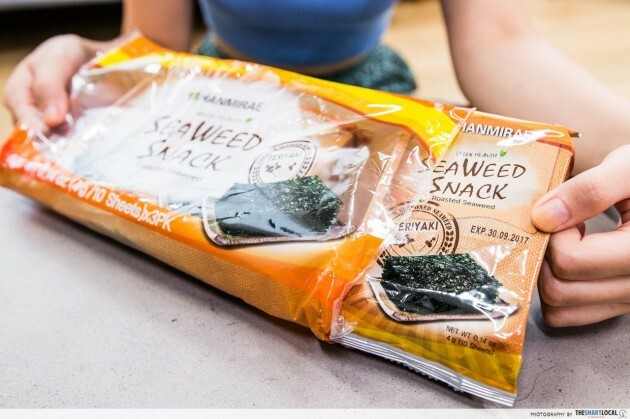 It's bite-sized and a healthy alternative to the normal chips, so pick it up at FairPrice if you're looking to transition to a healthier lifestyle. Thinly sliced and well-seasoned, it is super savoury with a tinge of sweetness from the teriyaki sauce. 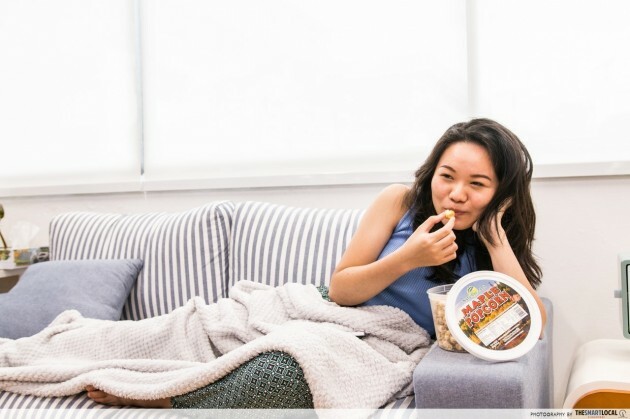 Laced with fragrant maple syrup and made with the finest ingredients, Natural Park Maple Popcorn is a Canadian product that's great during those Friday nights netflix and chill sessions when you're feeling the munchies. Grab a pack of this and you won't always have to associate movies with having to pay $7 for mediocre popcorn at the cinema. 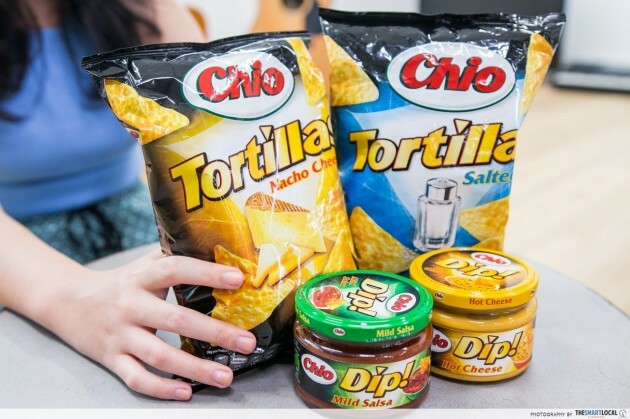 There are a few necessary components to an excellent tortilla chip: a good level of salt to draw out its flavours, a strong corn flavour, and whether the chip is strong enough to survive the dip test. 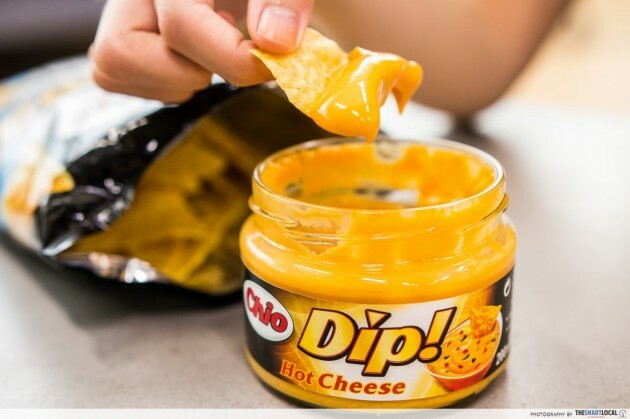 I'm glad to say that this German-made Chio Salted Tortilla with Hot Cheese Dip satisfies all the above requirements. 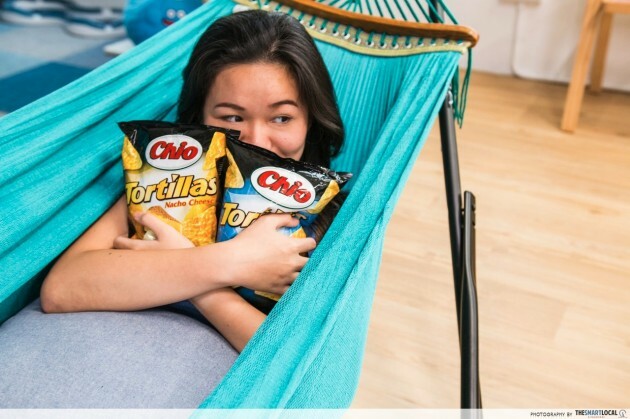 At first bite, the tortilla chip breaks off with a loud crisp - music to the ears. When paired with the hot cheese dip, there is an explosion of cheesy goodness in your mouth. I was expecting a fiery swarm of hot cheese - spicy red hot chilli and cheese, but it was more cheesy than spicy! Even if you don't have a strong tolerance for spiciness, this Chio Mild Salsa Dip is, as the name suggests, really mild. Similar to tabasco sauce, but much sweeter and less fiery. Don't separate this salsa dip from the Chio Nacho Cheese Tortillas - they are a pairing meant to be. 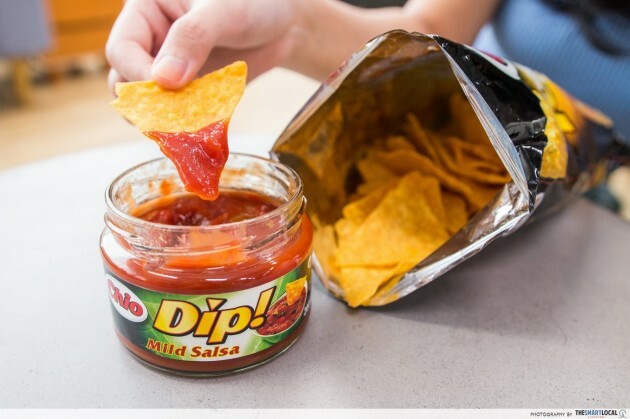 The cheese flavour in the tortillas gives it an extra umph when glazed with the salsa dip. 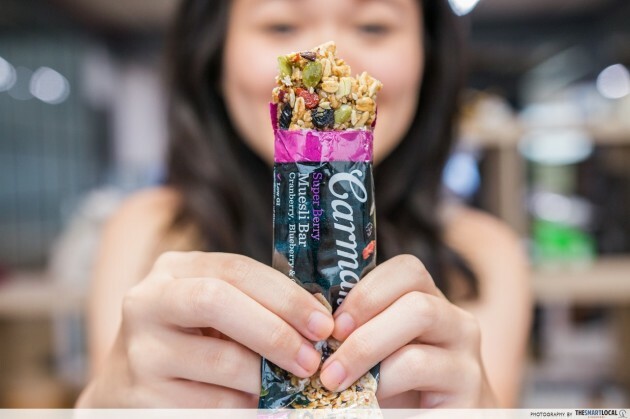 The vegan Carman’s Super Berry Muesli Bars is packed with cranberries, blueberries, and coconuts, and being a low glycaemic snack, controls hunger and provides sustained energy. 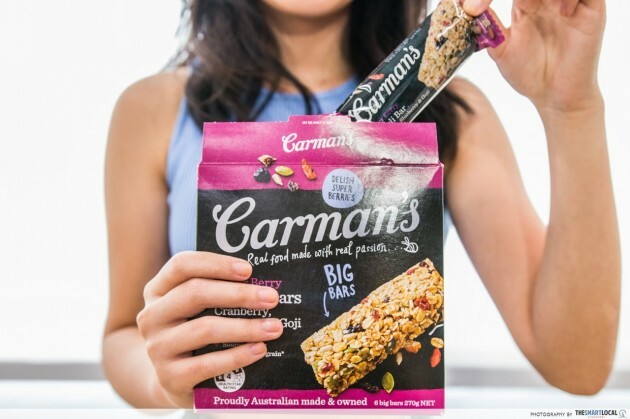 Carman's is also one of the rare brands sold in Singapore that's still run by a certified family-owned Australian business. A philosophy of theirs is "Food should come from the kitchen, not the chemist", which encapsulates the healthy eating mantra many a grandmother would approve of. The vegan community can rejoice with this number because it is vegan-friendly! 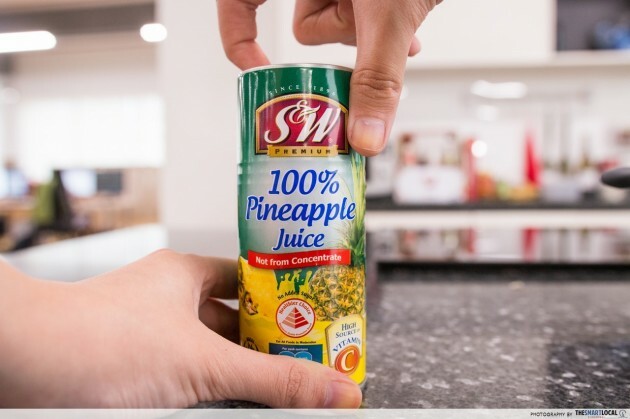 Hands down, this S&W 100% Pineapple Juice beats your hawker centre uncle’s 90-cents pineapple juice, and it even bears the healthier choice symbol by the Health Promotion Board. Drizzled with small pieces of pulp, you know you are drinking the real stuff - not made from concentrate - 100% pineapple juice, no sugar added and packed with Vitamin C. Switch up your regular soft drink with a healthier can of icy pineapple juice! 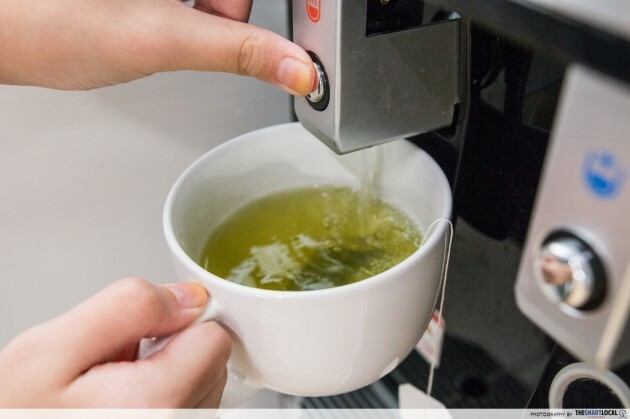 From matcha flavoured Kit Kats to Starbucks drinks, we love all things green tea flavoured! 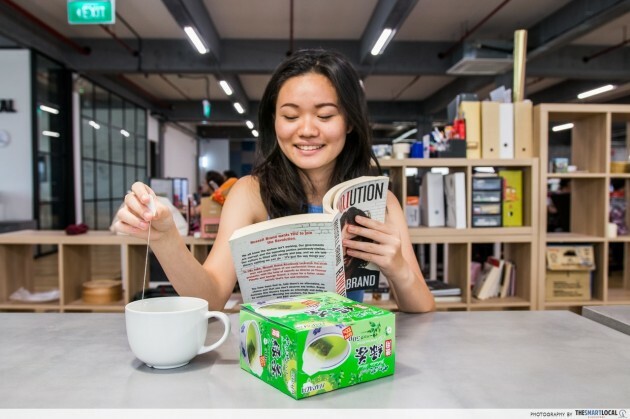 This Harada Japanese Green Tea is a timely addition to fuel your green tea addiction. Time tested with 100 years of history, Harada has a typically Japanese approach to QC-ing their teas - they take a hands-on approach to purchasing tea leaves to shipping the finished product, ensuring only the best teas are sold under their name. As you sip the green tea, you’ll notice a toasty taste lingering in your mouth, ending with a slight bitter aftertaste. Harada uses only the best tea leaves from Shizuoka prefecture, home to the cleanest air and spring water. The greatest debate of the century: smooth or crunchy peanut butter. While fans of smooth peanut butter go gaga over its creamy texture, detractors insist that chunky adds that crunch that oh so perfectly complements the texture. We might never ever agree, but we can enjoy Mayver’s Peanut Butter (375g) however we like it - smooth or crunchy. Produced in Australia, it’s organic and 100% natural - no added oil, sugar, gluten, dairy, cholesterol and hardened fats. Most people shudder at the thought of "healthy" food, but Mayver’s doesn’t disappoint - lightly roasted, handpicked Aussie peanuts mixed with sea salt and ground to perfection, it is naturally sweet and crunchy. Ps: each jar contains at least 153 peanuts - that’s a lot of peanuts packed into a small jar. Legend has it that the ancient Babylonians were the first to brew beer. They took this art so seriously that if you brewed a bad batch, you were drowned in it. Thankfully, we live in the 21st century where such practices have been banned. 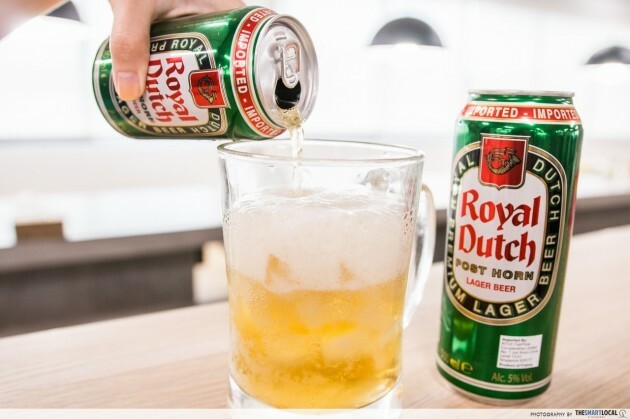 But even if this practice persisted, Royal Dutch Lager Beer (330ml x 6 cans & 500ml) will not incur their wrath as they serve beer brewed with 100% barley and pure spring water. A sip of this golden beer tastes rather mild but with a slightly sweet aftertaste. The flavour isn't too strong, and is a good introduction either for first time beer drinkers or those with a light palette. Shake up your eating habits at FairPrice today! Our regular FairPrice grocery loots: apples, digestive biscuits and washing detergent. 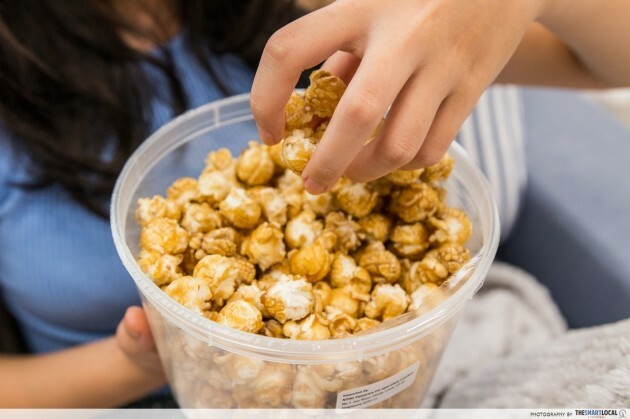 It doesn't always have to be the same old mainstream stuff - the next time you go to FairPrice, pick one new item as an alternative to your regular or approach the friendly FairPrice aunty to hunt down these exclusive snacks to spice up your grocery basket. 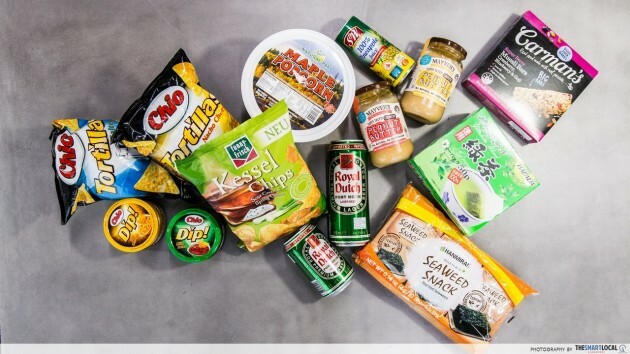 All ten snacks in this list are exclusively imported by FairPrice, which means that you won't find them in any other regular store. 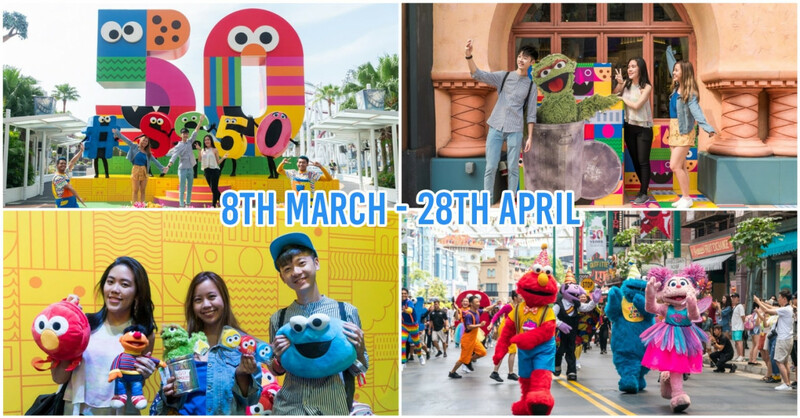 Stability in Singapore is a thing, but don't let your life get too boring. 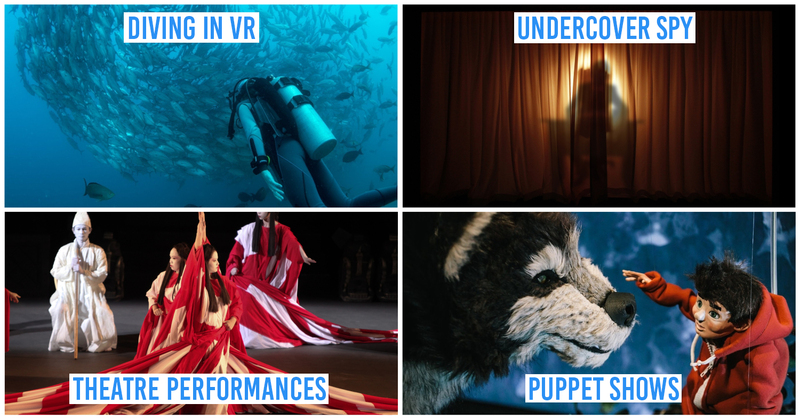 You deserve completely new experiences in your life, and that can begin where you don't expect it: at your friendly neighbourhood FairPrice! 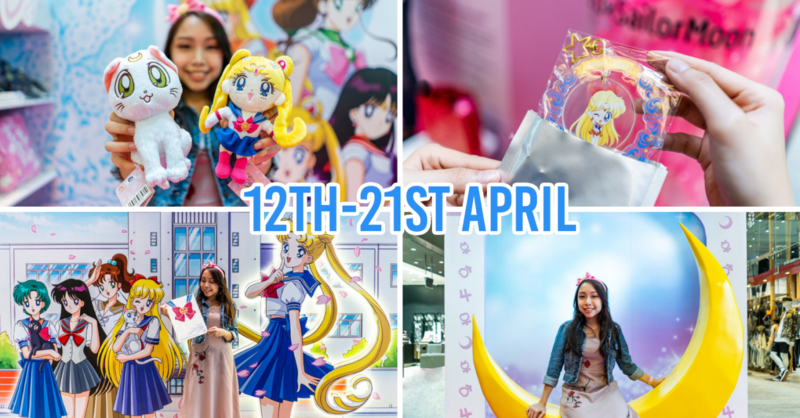 Products are subject to availability at selected FairPrice outlets.